Another day, another dollar printed. With one nation suffering from hyperinflation, their crisis highlights an important lesson Americans should know. For those of us who didn’t live through the Weimar Republic after World War I, we may have not had the chance to experience up close and personal what a real currency crisis and hyperinflation actually look like. The Weimar government was installed after the “War to End All Wars”, and began printing money by the trainload to pay off the reparations imposed on Germany after the conflict. At the end of the war, the Deutsche Mark was valued at two to one to the dollar. Just a few years later, the valuation of Duetsche Marks to the greenback was approaching two million. The factories in Germany couldn’t print the paper money fast enough to supply the demand; inflation skyrocketed. While use of credit cards and bank transfers is up, Venezuelans have to carry stacks of cash as many vendors try to avoid transaction fees. Dinner at a nice restaurant can cost a brick-size stack of bills. A cheese-stuffed corn cake — called an arepa — sells for nearly 1,000 bolivars, requiring 10 bills of the highest-denomination 100-bolivar bill, each worth less than 10 U.S. cents. The huge order for 10 billion notes can’t be satisfied by a single firm, the people familiar with the deals said. So it has generated interest from some of the world’s largest commercial printers, each vying for a piece of the pie at a time when low profits in bank-note printing have pushed many of them to cut back on capacity. You may be asking, How did Venezuela get to this point? Aren’t they flush with oil? The simple answer is Venezuela got hooked on the magic fairy dust of socialism and the promise of petrodollars falling from the sky forever. They overspent on promises to the common man while denigrating those capitalist boogie men that were the only ones who could keep the oil fields producing. One day they woke up and realized that never in their wildest dreams could they pay off the debt they ran up to the world in the form of bonds and ordinary bank debt to Western financial institutions. They even borrowed from the Chinese “white knight” to keep things going. 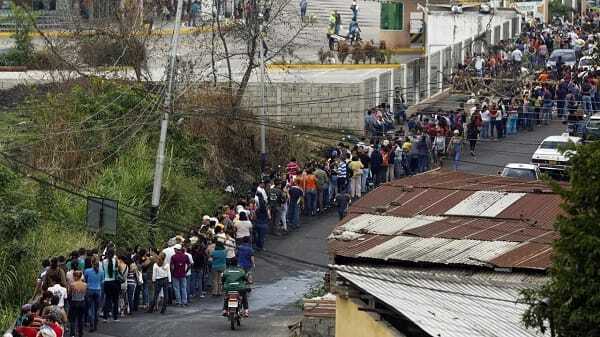 Unfortunately for Venezuela, they have run into the perfect storm of financial collapse. The Chinese economy is in for a hard landing and the price of crude oil plummeted on world markets, with no recovery in sight. Now they have to pay the piper. And the only way they can even think of doing so is with a wildly devalued bolivar. Hence, they are literally printing as fast as the 747s can deliver money. The Venezuelan economy is close to collapse. Hyperinflation is rampant. There is social unrest in the streets, cats and dogs living together. In short, it’s really bad for everyone involved, government and peasant alike. Don’t think it can happen here? Think again. The Obama administration announced this week we are over $19 trillion in debt, and will be at $20 trillion in no time. This doesn’t even begin to count all our unfunded liabilities. Congress and the president just agreed on a budget deal that gave back all the spending discipline of the last decade (little as it was) and tacked on billions of additional spending. The markets crashing around us are the proverbial canary in the economic collapse coal mine. If the U.S. fiscal train doesn’t change course, we could very well be in for the same scenario as Venezuela. Are you protected against such a scenario? If you’re overexposed to paper assets, you may want to consider protecting your savings with physical precious metals. Our politicians can print all the paper money they want to service our absurd debt, but they can’t print gold. When you’re ready to get started, give us a call or simply click here to get a free info kit on moving your savings to gold. Is the world economy trapped in a death spiral? Find out here.